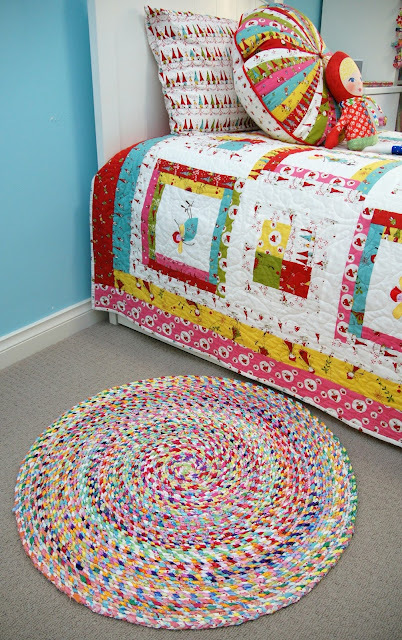 Tied with a Ribbon: A finished Scrap Rug and other projects! A finished Scrap Rug and other projects! 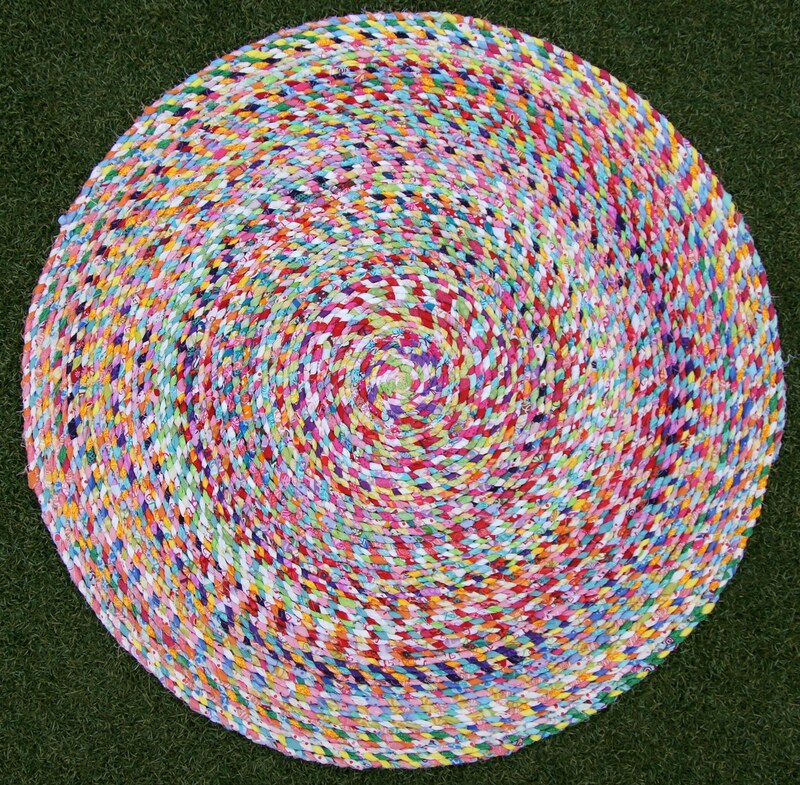 Thought I would share with you this Scrap Rug I made a few weeks ago. It has now found its home beside my younger daughters bed. This was a great way to have a serious stash bust. I went through fabrics that would be long enough for the project and used a heap of fabrics that I had that didn't really match anything, were left over from other projects and even ones that I had bought and just did not like as much anymore. By the time they were all platted into the rug they all just seemed to go and the colours are more visible than the prints on the fabrics. I did go through quite a bit of fabric in this stash busting Scrap Rug. 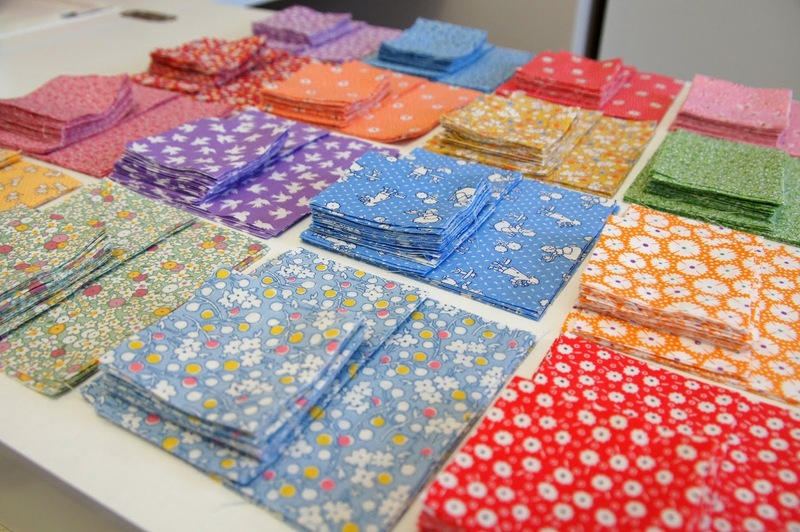 A new project I started this week was with some of these fabrics from the Amy Butler - "Lark" range. I just fell in love with the beautiful large flowers and loved the red, pink and navy. I went through my stash as well to pull out some fabrics to go with these as I had only bought a few prints from the range. 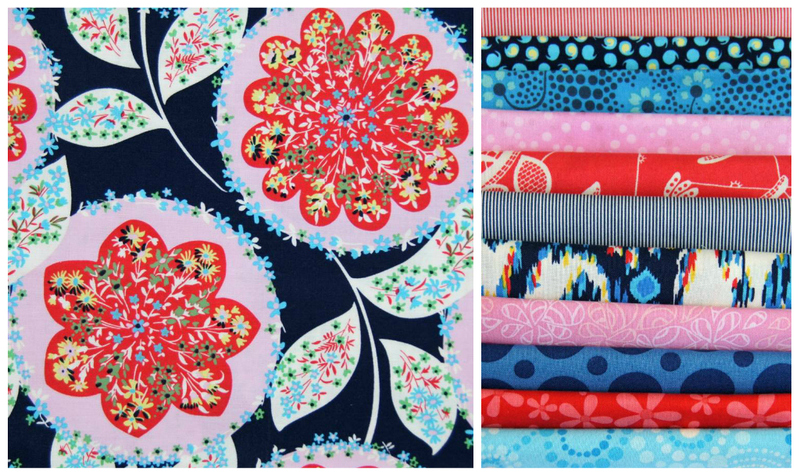 My quilt of choice for these fabrics was "Mary Mary" by Janelle Wind. She is a very talented designer. I have made quite a few of her patterns before and they are always well written and I love how quickly this quilt came together. Over the weekend I was lucky enough to get away for the "Threads of Friendship" Retreat. As many of you may know, I run a few Retreats with my Sew Along partner Claire - so to actually attend one as a "sewer" was just delightful. These 1930's fabrics were what I took to work on. 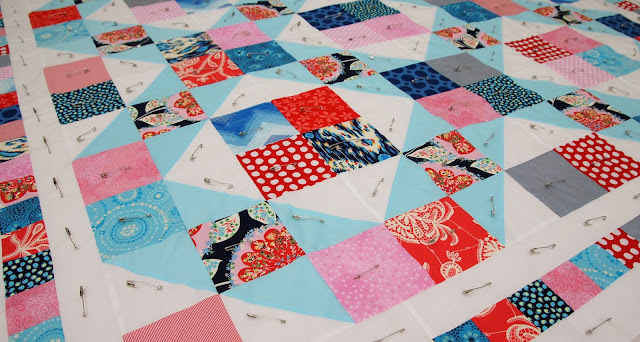 The quilt pattern for these is "Fireworks" by Thimble Blossoms. There were lots of laughs and projects going on over the weekend as well as lots of lovely ladies who were doing all sorts of Crafts. Including Photo Books, embroidery, quilting, crochet, dressmaking - there were lots of ways to be inspired. Along for the weekend among many other women were Janelle from JanellyBelly Bags and Things, Claire from Claire Turpin Design and Lisa from A Spoonful of Sugar. 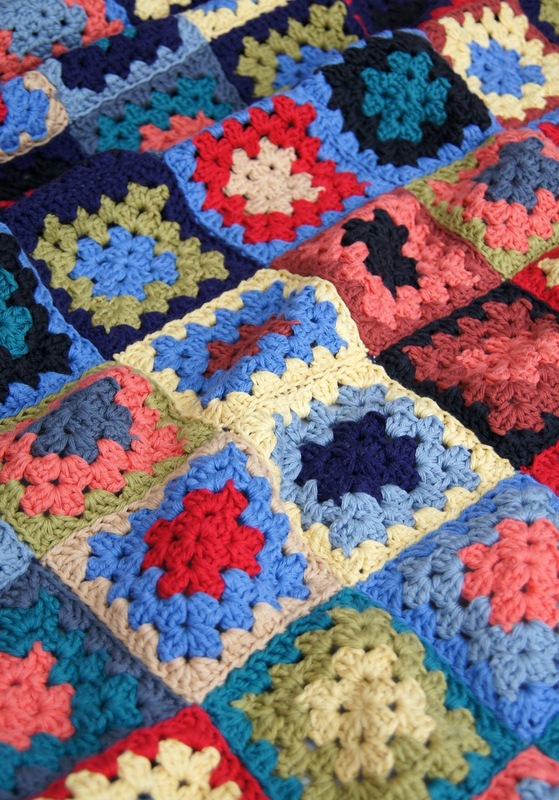 And certainly last but not least - here is the Crochet Granny Square Blanket I finished and gifted recently. 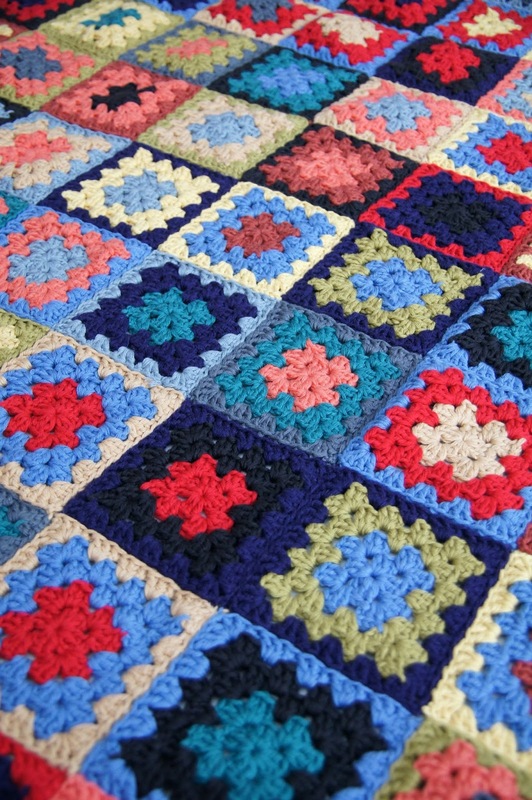 I made it for my Dad - choosing bright but homely colours to remind him of his childhood. I used one of my favourite yarns - Brown Sheep Cotton Fleece. I hope he loves it as much as I treasured making it for him! Your scrap rug looks amazing. So colourful and fun! Love your scrap rug - I also think that your MARY MARY quilt is looking good - can't wait to see that finished. Cushions, Quilts and Blankets - Oh my!